CART simultaneously converts the spoken word immediately into a verbatim text translation using captioning equipment and computer software. 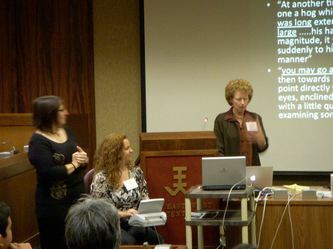 The translation appears on a screen for deaf and hard of hearing clients to follow along with a meeting or presentation. The Americans with Disabilities Act recognizes real-time and remote captioning as an auxiliary aid that affords effective communication access. Sami Silvia, captioner, providing CART services for Barbara Earth at the Hawai'i Sign Language presentation for the 2013 International Conference on Language Documentation and Conservation (ICLDC) in Honolulu, Hawaii. Real-time captioning is an accessibility solution for deaf and hard of hearing persons who prefer to communicate in English. Real time captioning is a computerized system where court reporters using stenographic equipment transcribe speech to text phonetically using stenographic shorthand code. The stenographic machine is connected to a computer containing software that decodes the shorthand into words and displays them in a captioned format. The captioning is called "real-time" because the data is transmitted instantaneously during a live broadcast, presentation, meeting, etc. Using a real-time captioner, on-site or remotely, allows the deaf or hard of hearing consumer to watch a video screen and have an instantaneous transcription of any and all spoken messages presented to them in exact English verbatim. Similar to simultaneous interpreting, real-time captions have a slight delay when compared to the actual audio, usually 2-3 seconds. Because real-time captioning is typed and displayed as they are produced without time to proof read, some errors do occur but they are usually minimal. Skilled real-time captioner's are capable of transcribing 225+ words per minute with an accuracy rate of 98% or better. Providers will supply use of basic equipment only including stenographic machine and laptop computer. Providers may negotiate additional charges for additional display and telecommunication equipment. A captioner may charge a fee per page if a hard copy of the unedited transcript is requested. A fee may also be charged for electronic copies of the transcript. overseeing court reporters, or by the National Court Reporters Association (NCRA) at http://www.ncraonline.org. There are currently 10 different certification programs established by NCRA, some of which are not listed on the Hawaii Administrative Rules. How can real-time captioning be used with deaf or hard of hearing consumers? Real-time captioning is an excellent means of providing communication access for deaf and hard of hearing persons who are not fluent in sign language or who lost their hearing later in life. For some written English may be the most effective means of communicating. Even for deaf and hard of hearing persons who use sign language there times when a deaf or hard of hearing person may prefer to see word for word in exact English what is being said in a meeting, class, or presentation. How can I hire a captioner? Isle Interpret can assist you securing a real-time captioner. Request a real-time captioner. Can I hire a real-time captioner instead of a sign language interpreter? Not necessarily. Take your lead from the language needs and preferences of the deaf and hard and hearing persons requiring communication access. Real-time captioning and sign language interpreters meet different language needs and are often selected according to whether a deaf or hard of hearing person is culturally Deaf or a late-deafened adult. Culturally Deaf and hard of hearing person's first language is usually sign language and English is their second or third language. As such, culturally Deaf persons usually prefer to use a sign language interpreter. Late-deafened adults' first language is usually English if they have learned to sign at all. For these deaf and hard of hearing persons, captions might provide better communication access and be more appropriate. It is recommended that you find out from the deaf or hard of hearing person their preference for the event you are requesting services, prior to making an arbitrary decision or what form of communication access accommodation to provide. How much does real-time captioning cost? For information on the cost of real-time captioning, please contact our office at info@insleinterpret.com. We will help determine if onsite or remote CART services will meet your needs and provide an estimate of the cost.